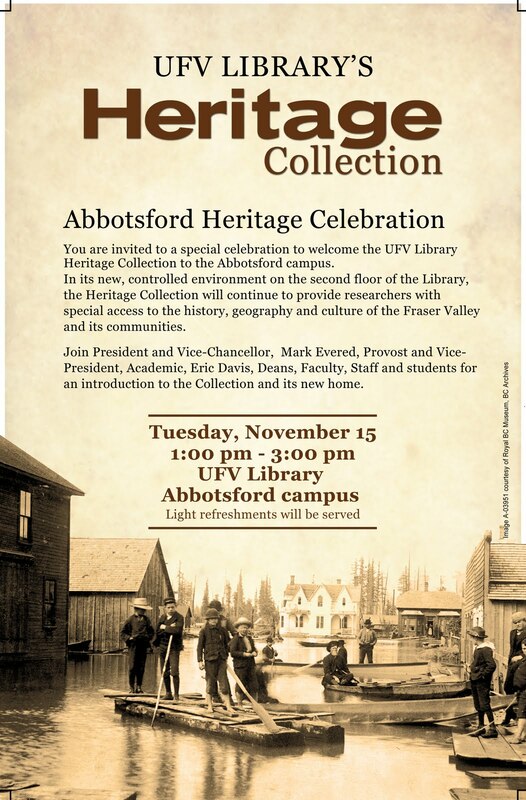 Come celebrate UFV Library's Heritage Collections! You are invited to a special celebration to welcome the UFV Library Heritage Collection to the Abbotsford Campus. In its new controlled environment on the second floor of the Library, the Heritage Collection will continue to provide researchers with special access to the history, geography, and culture of the Fraser Valley and its communities. Join President and Vice-Chancellor, Mark Evered, Provost and Vice-President, Academic, Eric Davis, Deans, Faculty, Staff and students for an introduction to the Collection and its new home. Click here and enjoy an online display created for the event. Explore our new Guide to Research for the Heritage Collection for details about the collection including its depth and breadth as well as links to other Fraser Valley archival collections.